After a little reading, I was ready to face my duck-cooking fears. It seemed all I’d need to make delicious, crispy duck was a knife to make hashes through the skin (being careful not to pierce the meat), a lot of open windows in case there was smoke as the fat rendered, and patience. Neal can attest that patience is not one of my virtues, but I promised myself I would wait until the skin went from the color of scorched Southern California hillsides to mahogany, and that I wouldn’t worry about overcooking the meat, even if it meant walking into the family room and sitting on my hands for 15 minutes. Fortunately, Neal didn’t know this little bargain I struck with myself, because I couldn’t wait long enough. My first attempt at the dish I concocted, the duck with a Murcott and balsamic reduction, fresh Murcotts and Beluga lentils proved a tasty combination that failed in the execution. So I tried again, though this time the duck wasn’t on sale. Maybe it was the extra couple of bucks I had to spend, or that Neal called from work half way through cooking the duck to tell me he was stuck there, poor thing, but I let that duck sit simmer until all of the fat had turned into a decadent crust that hugged the duck breast. I served it with some tender spring asparagus and sat quietly eating it by myself, admiring the texture, and grateful for on sale duck. *Murcotts are one of my favorite kinds of citrus. Available from January to April, I like them even more than blood oranges, which have long been the front-runner. They are the color of my kitchen, easy to peel, and their flavor is bright and refreshing, sweet and tangy, which makes them perfect for cooking. Trim duck breasts of any excess fat at the edges. Pat dry and cut a crosshatch pattern deep into the skin side, being careful to not to pierce the meat. Heat a sauté pan over medium heat, then put the duck in skin-side down. Cook until all of the fat is rendered and the skin is very crisp, about 25 minutes. Remove duck from pan and set aside. Drain off all but 1 tbsp of fat (I recommend running it through a coffee filter and putting aside for future use) Lower heat to medium-low. Add onions and season with salt and pepper, cooking until the onions are soft. Add juice, zest and balsamic and return the duck to the pot skin-side up. The liquid should come about half way up. Cook duck for 5-7 minutes, or until the temperature at its thickest part registers 150. Remove the duck and let rest for 10 minutes. In the meantime, reduce the remaining cooking liquid until it thickens slightly. 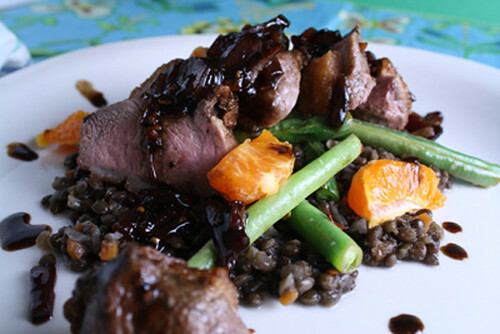 Slice duck and serve over lentils, sprinkle with fresh Murcott slices and drizzle the top with balsamic reduction. Heat a tablespoon of olive oil in a medium saucepan over medium heat. Add carrots, celery and onions, season with salt and cook until soft. Add lentils and enough water to cover them by about 3 inches. Cover and cook until the water is absorbed and the lentils are soft, but not mushy. Season with salty and pepper. Beautiful dish! I’ve never made duck at home, but this sounds like a great recipe to start with. Love this post…because sometimes the story really is about the food. Regardless if it’s drowning in emotion. Nailed it again, Greeny.